GI Joe's "Pursuit of Cobra" theme was an amazing ride. While not every figure was a homerun, and there were some downright clunkers, a lot of amazing figures came out of that line. Accessories and versatility were amped up to 11. Great new versions of classic characters, action movie homages, new articulation... the line went big. Unfortunately, it more or less went out with a whimper, ending its run with some canceled gems and a final series that nobody saw in stores. The new 30th Anniversary collection seems to be trying to rectify the unceremonious end of PoC by introducing some of those canceled and hard-to-find molds in its first series. The Volcano-Viper was one of those sought-after figures that never got the release it deserved, and Hasbro's attempt to fix that problem can be found in the 30th Anniversary Hazard-Viper. Reminiscent of the classic Toxo-Viper of the G1 days, The Hazard-Viper ties into the new line's theme of "Compound Z," which is apparently meant to take the Joes into Resident Evil territory. Hazard-Vipers work with unpleasant and nasty substances. They may plant them as part of an attack, or clean them up after an operation. As part of their job, they deal with secretive lab experiments, like the mysterious canisters they carry that contain a dangerous new chemical substance, Compound Z.
I'm not so sure I like the themed sublines that began with PoC and appear to be continuing into the 30th, but it's not like you can't use the figures outside of their existing storyline. 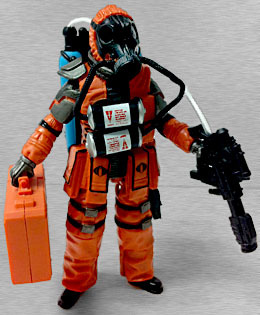 The Hazard-Viper makes sense for any kind of toxic chemical clean-up or dispersal. The sculpt is entirely Volcano-Viper except the arms, which I believe come from Skydive. The Volcano-Viper already used some parts from the Ice-Viper, so this figure is a mish-mash of a mish-mash. The sculpt works pretty well for a hazardous materials trooper, with a nice blend of armor, pouches and baggy suit. The head is a generic ski mask, but you'll be using the gas mask helmet anyway. 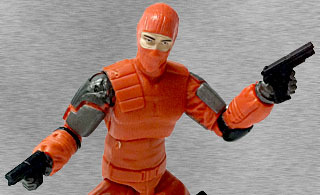 The figure is mostly molded in orange plastic, with various gunmetal and black accents. The "Compound Z" in the accessories is represented by a light blue, which isn't your typical bright green usually used to represent noxious chemicals in fiction, but it works. He's got little Cobra sigil tampos on his pouches and some warning tampos on his oxygen tanks. About those oxygen tanks. He's got two: they plug into his chest and their hoses hook into his gas mask. They look fine, but there's a problem. There are only two of them. The Volcano-Viper had three; in addition to the chest tanks, he had one on his back. 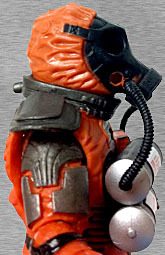 This contributes to a sort of half-finished feel for the figure, as he has a large unused hole in his gas mask, and a protruding peg coming from the top of his back. I absolutely hate figures that don't seem finished, and this unfortunately seems to be kind of a trend in some of the 30th figures. He feels like he's missing pieces, and that's just not cool. The 30th line continues PoC's tradition of loading the figure up with accessories, which is good, but unfortunately they're not really as well thought out as they should be, which keeps that "half-finished" vibe going strong. They're mostly reused, which isn't bad in itself, but some of them just seem a little out of place, especially when one of those spots could have been filled with a third oxygen tank. He gets the gas mask helmet, which sadly now lacks the transparent lenses of the Volcano-Viper's. 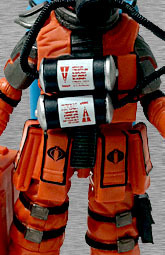 He also gets Arctic Destro's backpack/tube/gun combo, which now appears to be filled with Compound Z. It's a nice repurpose, but the huge button on the back is kind of annoying and obtrustive. 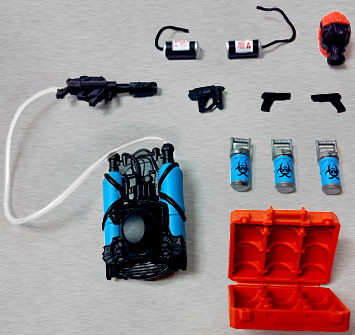 In the case of Arctic Destro, the backpack could be filled with water and the button would cause the gun to squirt, but I'm not sure if that feature is intact here, as it's not mentioned anywhere on the package and it doesn't seem like there's an intuitive way to get water into the pack. He also gets a cool working carrying case that holds three included canisters of Compound Z. While this whole set-up comes from The Doctor, a Rise of Cobra figure, it works great for the Hazard-Viper. There's also the standard Cobra insignia base, and a tiny little gun that looks like it has a tiny little tank attached to it. And then we get two pistols, which I can only imagine were included because they originally came with Skydive and Hazard-Viper uses Skydive's arm sculpts. Which is stupid. It'd be one thing if he had holsters anywhere, but the figure already has more accessories than he can carry before you add the oddly out-of-place pistols, and then you have to remember he's missing one of his oxygen tanks. While it's nice that fans finally get to own the great Volcano-Viper sculpt without breaking the bank, it's really a shame that this figure doesn't live up to its potential. Eliminate some of the unnecessary accessories, give him back his missing tank, and make those lenses translucent, and this would be a must-have figure. As is, it's just not quite there.